Trilogy at The Polo Club is a gated active lifestyle community located in Indio, California. Developed under Shea Homes’ popular Trilogy brand, this community began selling in 2013 and plans call for approximately 1000 homes upon completion. The community will have a 55+ enclave within the larger, non age-restricted community. Trilogy at The Polo Club offers sterling amenities and modern homes that Shea Homes is known for. Trilogy at The Polo Club also benefits from its prime location in the highly desirable Palm Springs area, known for their year-round pleasant climate, bountiful golf courses, and selection of vineyards and state parks to explore. Trilogy at The Polo Club matches the area’s natural beauty with their extensive system of parks, open-air homes, and unobstructed views of the surrounding mountains. The community is home to the 25,000 square-foot Polo Club, designed to meet the needs of residents socially, mentally, and physically. Several attractive amenities like a state-of-the-art fitness center and yoga studio keep residents in top physical shape. 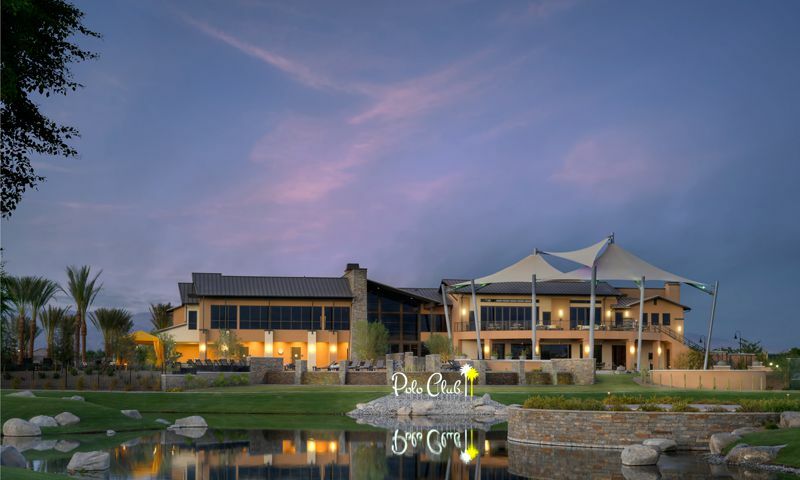 The Polo Club also features a full-service restaurant, a grab-and-go market, a game room complete with billiards tables, as well as catering and demonstration kitchens. Trilogy at The Polo Club will also has plenty of opportunities to enjoy the great Southern California sunshine. The clubhouse has three outdoor pools, three tennis courts, and a scenic pond for enjoying a quiet evening with your significant other. Trilogy at The Polo Club also features 19 parks that weave through the community’s clusters of homes, creating a natural and open social space for neighbors and several options for outside activities. Trilogy at The Polo Club will have approximately 1000 homes upon completion. These homes range in size from 1,376 to 2,549 square feet and feature two to three bedrooms, two or two-and-a-half bathrooms, and an attached two to three-car garage, making Trilogy at The Polo Club a great option for residents looking to downsize or live in a more luxurious space. Although open to all ages, Trilogy at The Polo Club will have a 55+ enclave, where the Empire and El Dorado collections are offered. The homes at Trilogy at The Polo Club will also feature striking architectural characteristics. The ceilings are dramatically tall, the kitchen countertops are made of granite, and the covered outdoor patio space seamlessly blends with the interior space. The homes at Trilogy at The Polo Club also feature energy-efficient technologies like dimmer switches on all interior lights and a user-friendly solar power generation system. Residents at Trilogy at The Polo Club enjoy a terrific community experience. Spacious side yards and shared parks create an open, friendly environment where neighbors become quick friends. The community’s emphasis on a livable outdoor space also means that residents have plenty of areas to enjoy morning jogs or community get-togethers. Trilogy at The Polo Club also has a full-time activities director who organizes events, clubs, and activities for residents based on their requests. Trilogy at The Polo Club is located in Indio, California, just outside of Palm Springs. The community is about 25 miles from the Palm Springs International Airport and just five miles from I-10, making trips to other countries or counties very convenient. A large shopping center for everyday conveniences is just three miles away in Coachella. Golfers will particularly enjoy living in Indio, as the Palm Springs region has over 100 golf courses, making it one of the world’s most famous golf destinations and the most popular in California. Active adults can also explore the Coachella Valley History Museum, the La Quinta Museum, or the Children’s Discovery Museum for when the grandkids visit. The area’s collection of state parks and wineries make for terrific adventurous or relaxing day trips. Trilogy at The Polo Club, a picturesque community in a premier region, is a terrific choice for any homebuyer. Polo Club - 25,000 Sq. Ft. There are plenty of activities available in Trilogy® at The Polo Club. Here is a sample of some of the clubs, activities and classes offered here. The El Dorado collection offers six models to choose from and is offered in the 55+ section within the community. Each home features two bedrooms, two bathrooms and an attached two or two-and-a-half-car garage. These beautiful homes range in size from 1,376 to 1,927 square feet of living space. Most of these plans feature an extra den space. The Freedom I collection consists of four floor plans ranging in size from 1,448 to 1,928 square feet. They include two or three bedrooms, two bathrooms, and attached two-car garages. There are four models offered in the O2 collection ranging in size from 1,902 to 2,549 square feet. These homes are offered in the non age-restricted portion of the community. All homes feature two bedrooms, two to two-and-a-half bathrooms, and an attached two-car garage. Most homes also include a den that can be turned into a third bedroom. The Freedom II collection offers three floor plans that range in size from 2,039 to 2,367 square feet. These plans come with two or three bedrooms, two-and-a-half or three bathrooms, and attached two-car garages. The Empire collection offers three floor plans to choose from that range in size from 2,112 to 2,451 square feet. These plans are offered in the 55+ enclave within the community. All homes have two bedrooms, two-and-a-half bathrooms and a three-car garage. These homes also feature a den that can be converted into a third bedroom. Brand new clubhouse with true lifestyle features of an onsite restaurant and great workout facility. I love the outdoor areas! 55places.com is not affiliated with the developer(s) or homeowners association of Trilogy® at The Polo Club. The information you submit is distributed to a 55places.com Partner Agent, who is a licensed real estate agent. The information regarding Trilogy® at The Polo Club has not been verified or approved by the developer or homeowners association. Please verify all information prior to purchasing. 55places.com is not responsible for any errors regarding the information displayed on this website.